"The tower is all that stands between light and darkness…" Sony has revealed a brand new "international" trailer for The Dark Tower adaptation, based on Stephen King's popular book series. Directed by Danish filmmaker Nikolaj Arcel, this gritty sci-fi western is about a legendary "Gunslinger" roaming an Old West-like landscape in pursuit of the Man in Black, who wants to destroy the fabled Tower. 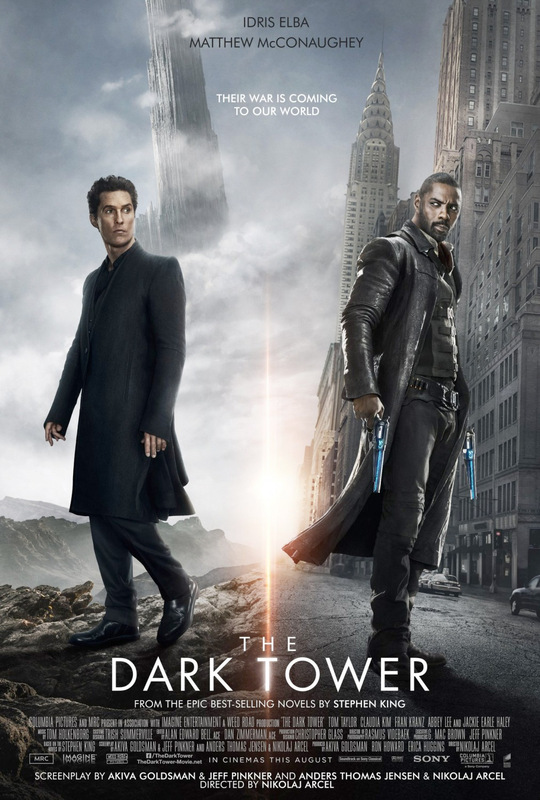 Idris Elba stars as Roland Deschain, with Matthew McConaughey as the Man in Black. Also starring Abbey Lee, Jackie Earle Haley, Fran Kranz, Tom Taylor, Katheryn Winnick, Alex McGregor, Nicholas Hamilton, Claudia Kim, and Michael Barbieri. This is honestly looking better and better with every trailer. And you know - even if this movie isn't that great, I still think Idris Elba is a totally badass gunslinger. Love him. You can still see the first official trailer for The Dark Tower here, plus TV spots here & a legacy featurette. For more info and updates on The Dark Tower movie, follow on Twitter @TheDarkTower or Facebook here. The Gunslinger, Roland Deschain (Elba), roams an Old West-like landscape where "the world has moved on" in pursuit of the man in black (McConaughey). He's also searching for the fabled Dark Tower, in the hopes that reaching it will preserve his dying world. The Dark Tower adaptation is directed by Danish filmmaker Nikolaj Arcel, of the films King's Game, Island of Lost Souls, Truth About Men, and A Royal Affair previously. The screenplay is credited to Nikolaj Arcel, Akiva Goldsman, Anders Thomas Jensen, and Jeff Pinkner. Based on Stephen King's novel of the same name, first published 1982, now a series of 7 books. Sony Pictures will open The Dark Tower in theaters starting August 4th this summer. Who's excited now?